The Philippines doesn’t lack for any adventurous activities. As an archipelago, it’s best known for its white sand beaches and marine life. You can go snorkeling in Puerto Galera, for example, or diving in Apo Island. 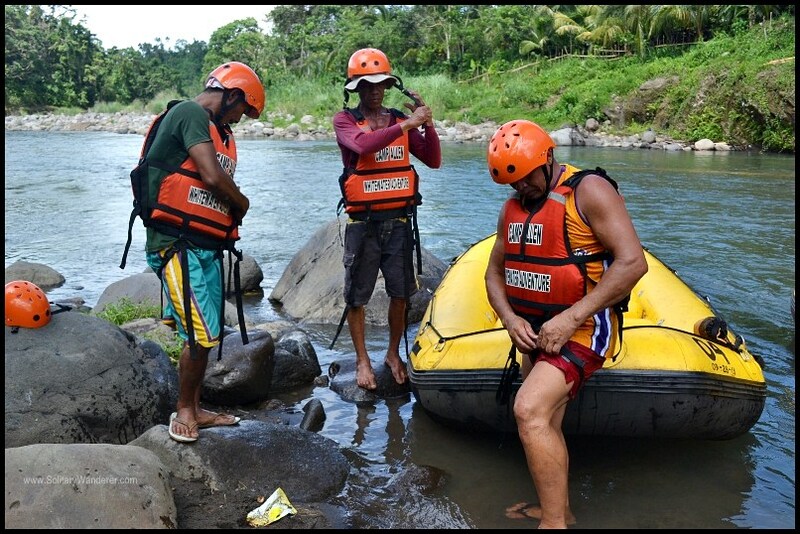 You can also go rappelling in Bataan or jump off a canyon in Danao, Bohol (similar to bungee jumping), go climbing in Batangas or caving in Montalban, among many, many others. 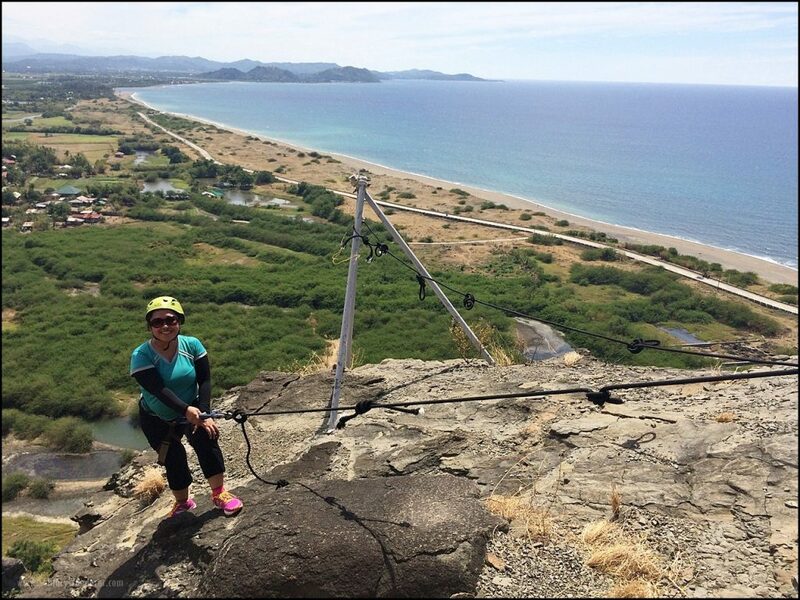 What if I tell you that there’s a place in Ilocos Sur where you can do a lot of adventurous activities in one place? This summer, head to Narvacan Outdoor Adventure Hub (NOAH) and enjoy activities close to the elements: earth, wind, water, and fire. 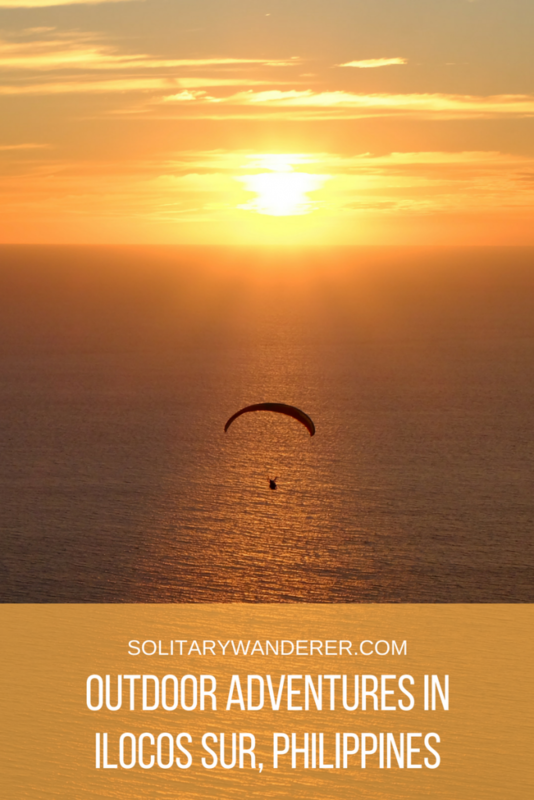 It offers the following activities: paragliding, climbing the via ferrata, ziplining, off-road driving, sailing, windsurfing, and kite surfing. 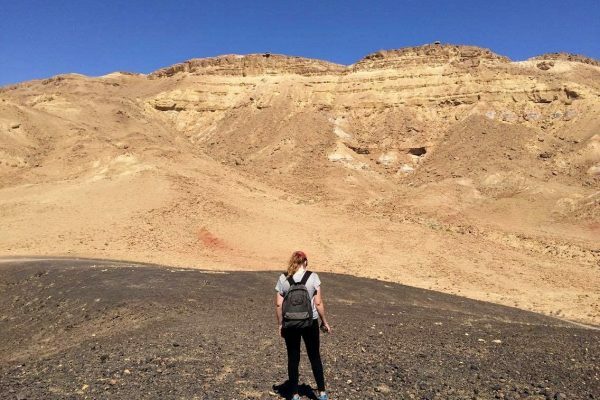 A unique adventure camp, NOAH is located between a mountain and the sea, making it the perfect base for all activities. 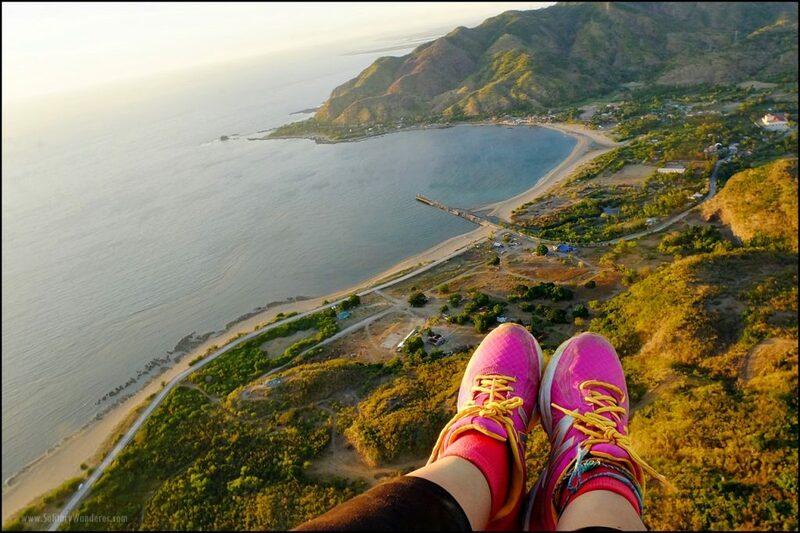 Definitely a must do, NOAH offers tandem paragliding, bringing in pilots all the way from General Santos City. The take off point is at the top of the mountain of Bantay Abot, which is accessible via their pick-ups and buggies. 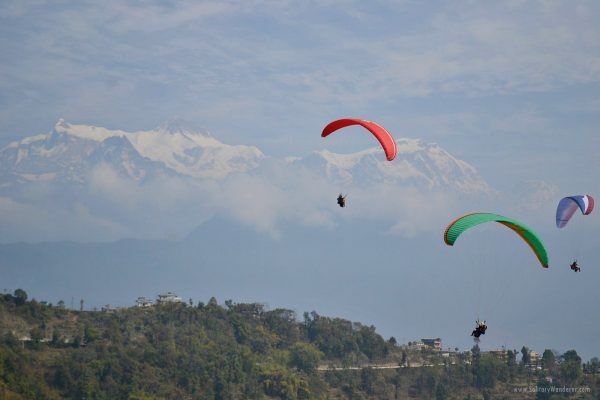 It wasn’t my first time to go paragliding (I went paragliding in Pokhara, Nepal), but I was as excited as my friends when it was our turn to go. My pilot, Airsport Specialist Buko Raymundo, is the only licensed paragliding instructor in the Philippines, and I felt very safe in his hands. He performed some tricks in the air, including flying so close to the peak that I could almost touch my friends, and handled the flight so well that I never felt anxious. I had chosen the best time to fly, too; it’s a beautiful sunset, isn’t it? At the top of the via ferrata. 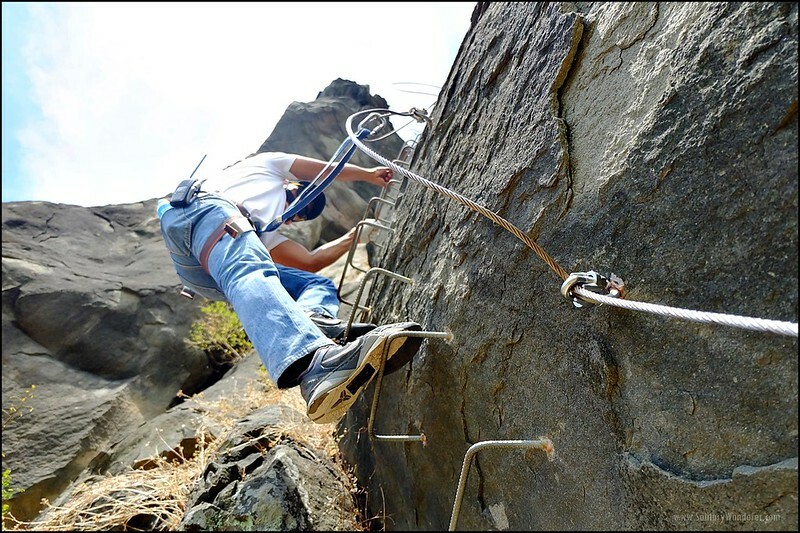 The Via Ferrata, the “Iron Way” or “Iron Path,” is a protected climbing route where climbers go up the mountain using iron rungs and a fixed steel cable where they can secure themselves. 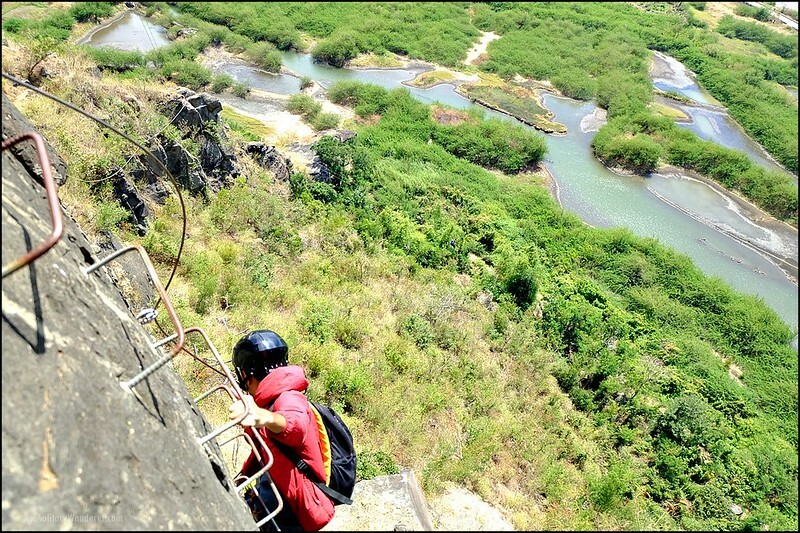 A popular via ferrata is in Kota Kinabalu in Malaysia; in the Philippines, there is none except in Ilocos. When we saw the cliff where the via ferrata was, we had to wonder if we could make it. It’s a vertical climb, and usually, only serious rock climbers could do it. Our via ferrata guide even wore jeans during the climb. However, because the via ferrata doesn’t need much equipment aside from a helmet, a harness, and a couple of carabiners, it can theoretically be done by anybody, no mountaineering expertise needed despite the challenge posed by the cliff face. I say theoretically because I don’t think it’s for everybody. One must be fit because you’d need strong legs and upper body to keep on going up. You’d need to be comfortable with heights, too, because you can’t help but look down. At NOAH, you need to climb over 200 ft on iron rungs, with nothing preventing your fall except for two carabiners attached to a steel cable. It’s not a straight climb, too. A little part of it was an overhang, and it was a lateral climb in at least two areas. I was excited in going up, but there were parts when I did feel a bit nervous. I went down from the peak on a Tyrolean traverse. Reaching the top, and descending via a Tyrolean traverse (100 ft), made the experience very much worth it. I would highly recommend this to those who are not afraid of heights! Driving this baby was a lot of fun! 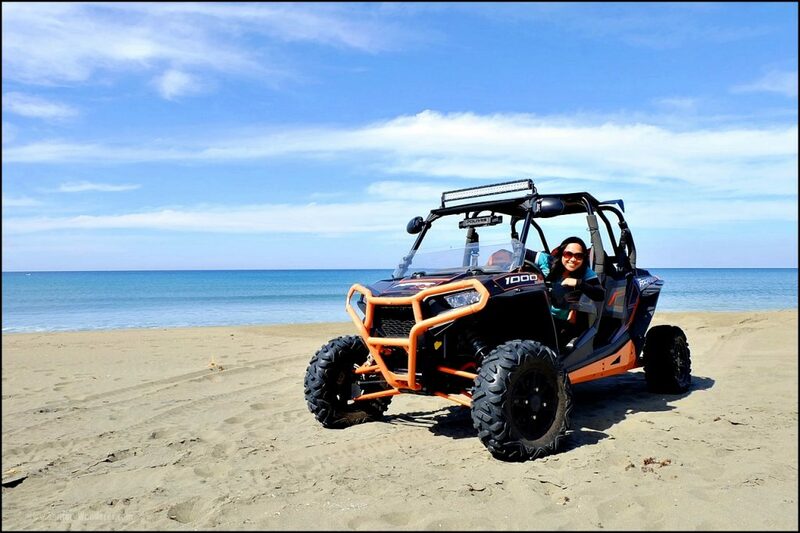 Considered as the “FIRE” activity, off-road driving at NOAH is done by the beach on a 4×4. There is a wide stretch of land with naturally formed dunes, and you can have a taste of what it feels like to drive a dune buggy. 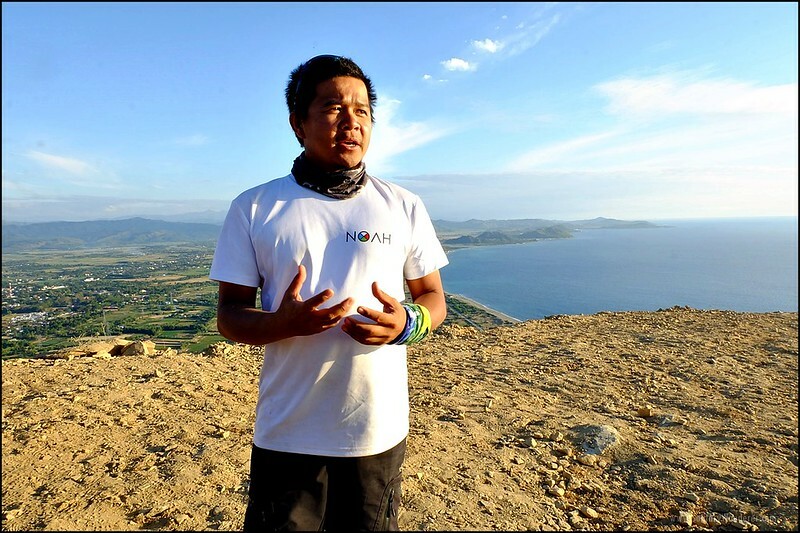 According to Joey Cuerdo, NOAH’s business manager, that stretch of land used to be a dumpsite. 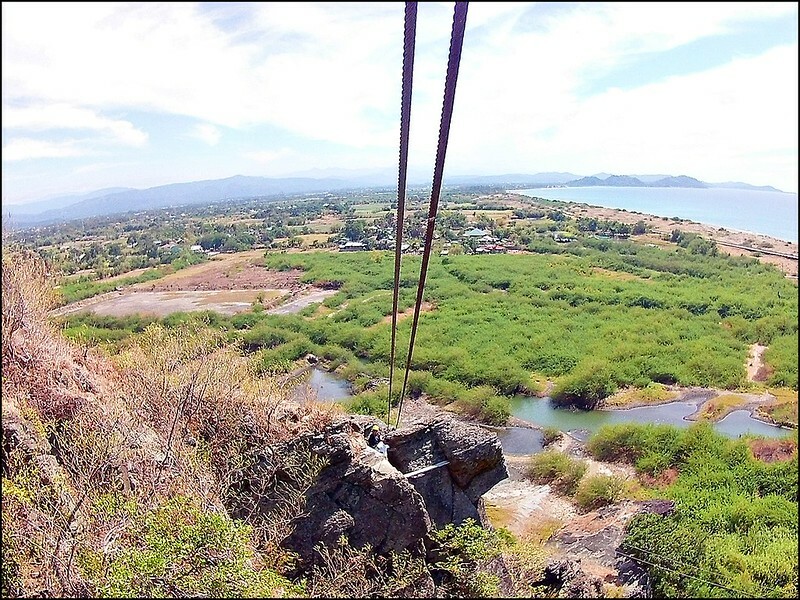 It was during conversations with Narvacan Mayor Zuriel Zaragoza that the idea of offering off-road driving in that spot was brought up. The over 1km-long coastline is perfect for the activity, too. 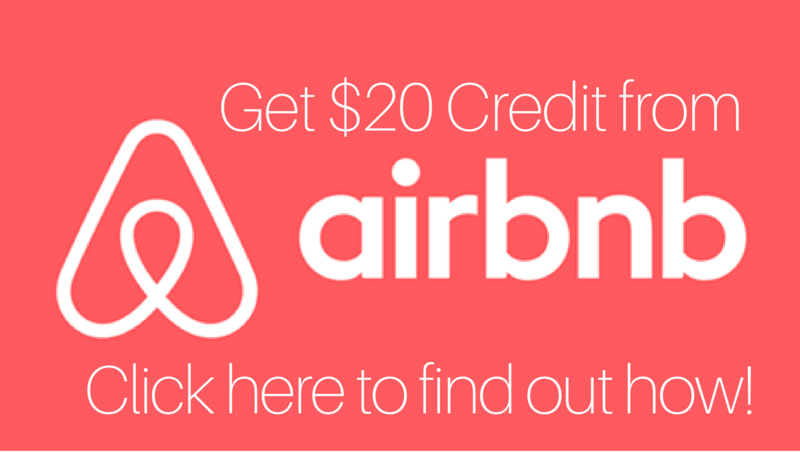 Cost: P2,500 per car (up to 5 persons). Of all the activities in NOAH, I didn’t get to try this. We were going paragliding after the activity, so I just opted to observe the instructors give my friends a quick lesson in windsurfing. They were taught how to stand on the board, how to balance themselves, and how to turn. The instructors were patient, and explained the process very well. 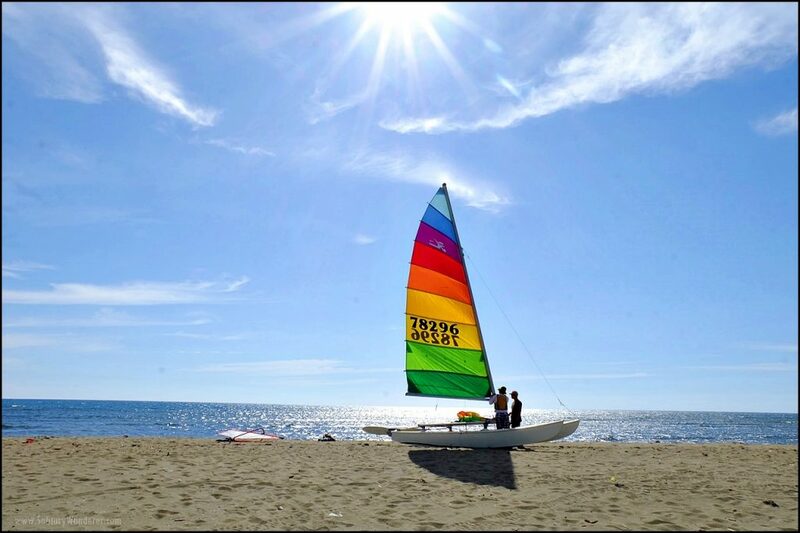 Aside from windsurfing, they also have a hobie cat and kitesurfing will be offered in the future. If going by public transportation, take any bus going to Vigan or Laoag. Ask to be dropped off at the Narvacan outpost, and from there, get a tricycle going to NOAH in Bantay Abot. There are two options as to accommodation when visiting NOAH. 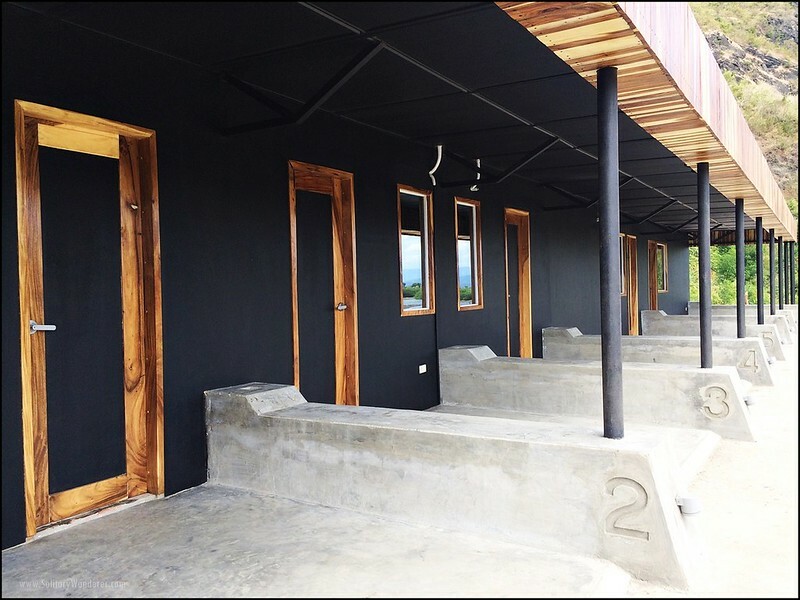 You can bring a tent and camp there — just pay P150 to use the facilities (bathroom, shower) — or book their air-conditioned room at P1,500 for two persons. As to food, NOAH has the Arko Restaurant on site, and dishes offered are varied and delicious, ranging from breakfast menu of pancakes and Filipino meals, to pizza, pasta, soups, and several main dishes. Prices start from P120 (for pancakes or plain crepes) and up. You can drop by anytime at Narvacan; TwoSix Olangco, a fellow UP Mountaineers member like Joey Cuerdo, is the operations manager and is always there. 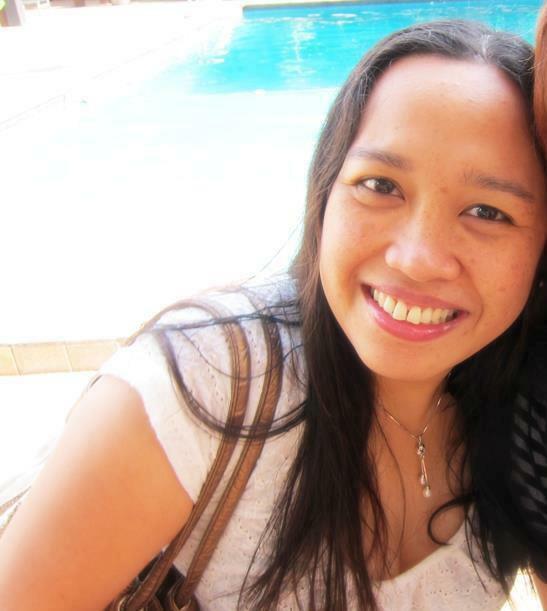 You can also contact him for reservations and other questions at +63-919-349-8473 or via landline at +632-734-8883. Which of these activities would you be interested in doing this summer? Do share!